Really? Why does this happen every time we’re traveling on a long road trip? This is fresh in my mind because it happened just recently. We anticipated how close we were to our house…less than 45 minutes. Soon we’d be pulling in our driveway, our pets would welcome us home, and we’d crash into our own comfy beds. But no! In the distance we could see the cars backed up on the freeway. They weren’t even inching along. They were at a dead stop. Why in the world would they schedule construction work so late? It’s almost midnight! Didn’t they know everyone would be coming back from spring break vacation? There’s not even a place to stop and go to the bathroom or get a snack! 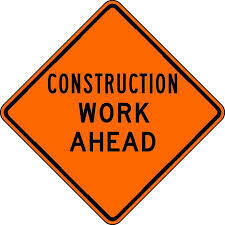 When road construction is going on, there are three things that always result. If we expect to be under God’s construction, then why are we surprised when things don’t go our way? Why are we upset when our predictable routine is suddenly shaken? Why do we complain when we have asked Him to help us with certain areas of our lives? Maybe you pray to be a more patient parent, yet when God gives you opportunities to practice this, you resist and express frustration because it’s causing too much delay. You pray for God to help you through a conflict with a loved one, but it just isn’t happening quick enough. And what about the mess? When we drove past the construction site I noticed bull dozers, jack hammers, and debris strewn all over the place. It almost looked like a bomb had exploded smack in the middle of it all! Sometimes certain areas of our lives have to get “messed up” before God can reconstruct it for something good. We ask Him to shine the spotlight of the Holy Spirit on our hearts and reveal any hidden sin. He shows us something in the light and the first thing we say is “Yuck!” But He can’t renovate and renew that area unless we are willing to humbly expose our sin, as messy as it looks. As creatures of comfort and convenience, we are experts at complaining. This isn’t the way I thought God was going to answer that prayer. I don’t want to come out of my comfort zone! The reality is that God often takes us out of our comfort zones and plunges us into a construction zone. We need renovation. We need a complete make-over of our heart. After road construction is complete, we notice great improvement. A two-lane road has emerged into a four-lane road. A dangerous, bumpy exit off the interstate is now safely smoothed out. A much-needed traffic light has replaced an ineffective four-way stop where multiple accidents had occurred. And it’s the same with us as God’s children. After construction has taken place in an area of our lives, we notice what God has done. Where we once had bitterness, it is replaced with forgiveness. Where we once were characterized by criticism, we extend more grace. Where we once clung with both fists to a besetting sin, we now claim victory with hands raised to God. So the next time you realize God is putting up a construction sign in front of you, don’t resist. Don’t complain. Don’t worry about the mess. With Him in charge of the construction process, you can trust that it will be complete in His timing! We are His workers and He is the master contractor. ← Are You Drifting Away? What a great change in perspective. Thanks! What is so ironic is that right after I posted this I left the house to go run errands. I was joyful in my heart and thanking God for the day. Then I came upon a sign that said “Major Construction Ahead”. I laughed out loud and was thankful I could take a different route to bypass the construction area!